Will burning this candle only help get me a job period or can I specify a specific job I am applying for? Steady work can most definitely be used for help with landing a specific job(s), as well as the more generic "help me find gainful employment in my chosen field". It is as Edward said. I always like to combine Steady Work with Money Drawing and Crown of Success formulas to up the ante. I'm just wondering why the candles for this steady work ritual are blue and white? Why not green? Is it because you're looking for "steady work" and not necessarily "money?" Re: why not green candles? That's the main reason--the goal of Steady Work is sustained employment. Many folks combine Steady Work with additional money-drawing and/or success works, to ensure that the work done is both valued and well-compensated by the employer. Hi, I want a candle for a specific job I want. steady work, crown of success, road opener, or a saint candle that I am praying to? I'm already doing a Novena candle at home myself. you can set more then one candle for a cause. Using crown of success to get the job, steady work to keep the job, etc, attraction to draw the job to you. All are applicable candles to use for the cause and can be used together or alone. Id think together would hit more aspects of the issue. Lodestones are great for getting what you want, I used one last year to get a job, I used the outline cat has on the LM website. thanks j82. how do i use a lodestone to get a job? just get a lodestone and put the necessary oils then put magnetic sand and ask to go get me a job? I have to tell you all of the amazing powers behind the Steady Work Candle and Boss Fix Oil and Powder. Ok first, let me start by saying that for the past 4 months, I have been looking for a new job. My co-workers treated me like crap, including my boss. Well I got the boss fix oil and powder. When my job place was empty (since I was the fool who was forced to work late at night) I sprinkled the powder under each of their desks, and wore the oil each day. I immediately noticed a change in the way they treated me. A lot less hassling me, a lot less bad-mouthing me behind my back. So I spoke to a psychic who kept telling me "Keep doing what you're doing, you'll have a new job by April". So I kept sprinkling the powder and wearing the oil. Went on SIX interviews, no new job, and here it was the first week of April. So I called her back, and again, she said "I'm telling you, you'll have a new job". Things started getting out of hand at work. Even though things seemed to go my way, there were still bumps here and there, and it wasn't fully the way I wanted. So April 10th comes around, and I call the psychic again. She tells me the same thing. I kept using the oil and powder. Then something said "Get the steady work candle". In my mind, even though I hate my job, it's best that I KEEP it until I find something new, incase they planned to fire me. I bought the candle. I lit it on April 22nd. April 25th, my boss quit. What a shock. April 27th my supervisor quit. As of April 29th, I am now the HEAD of my department. WAY MORE MONEY. WAY MORE BENEFITS. Re: Steady Work Candle and Boss Fix Oil/Powder. Glad to see you are getting desired results. Thank you! Things are going well, compared to what happened before. They were so MEAN to me. I found emails and instant messages where they were talking about me in the worst way. It was ridiculous. I am so glad that is over. But ...just to be on the safe side, I think I will continue to purchase the Steady Work candles and Boss Fix oils/candles. Also, I wanted to share that initially I was only making close to $30,000 when all this crap started happening with the old co-workers. My salary is almost double what I made previously, as well as a full benefit package completely paid for by the company, PLUS an additional $1000/month bonus for every month I remain employed with the company. I couldn't ask for anything more.. I figure I might as well make the best of the situation while it lasts. Hi, everyone. I am about to make a 3 vigil candles set for getting a job. There are boss fix candle, steady work candle, crown of success candle, road open candle, money draw candle in my mind. Which of them should I choose? or I can combine with other product like spell kit or oil to make them work efficiently? I understand it is better to burn vigil candle straight through. However for a job, it may take several round interviews. If I want to use candle set to do a spell for each round, what should I do? If I want to put interviewer's business card under a candle ? Which one is a good choice ? Really some help to make a shopping list here. Thank you all. For on-going work like job-hunting, consider setting your lights in runs - one after the other. That way the flame never goes out. You can put the interviewer's business card under the candle if you're working toward one specific job, or a more general petition that covers your intended sphere of work, salary range and benefits, proximity to your home, etc. otherwise. Then you can save use the business cards to use as name-papers and wear in your shoe with some Commanding or Master and Steady Work oils during the interviews. For your candle choices, the choices below sound good, although personally I'd save the Boss Fix for when you've been hired. A Road Opener followed by a run of 3 Steady Work Vigils is one alternative. If you work with Saints at all, you could also choose to follow the Road Opener by a run of 3 St-Joseph Vigils instead. 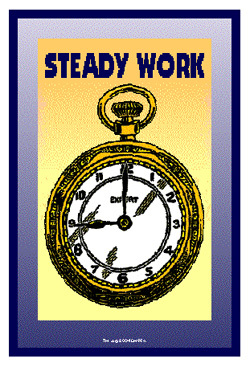 You could also consider the Steady Work Spell kit which is used to get a good job and already has all the ingredients you need: http://www.luckymojo.com/spell-steady-work.html . You also get a mojo hand with the spell kit which you can keep on you during interviews and at work - it's a superb hand that really packs a punch. Blessings and best of luck - do keep us updated! almondworld, are you setting these lights yourself or asking LM to set them? Thank you aura. I do pray to St Joseph, I've got St Joseph holy oil in my hand. There is a question. What kind of herbs and oil could I use to enhance the power of my weekly pray and help find a job quickly? I heard a way to write my name 9 times around interviewers' name one a paper and put it under a candle or in a mojo bag. Is it correct? And how to do it exactly? As you said I can put interviewer's name paper on my shoe. Right Shoe or Left Shoe or both ? gravel root is a good herb to help you find employment and deer's tongue will help you speak eloquently. Sampson snake root is also a good addition for job searches as it helps others respect you: http://www.herb-magic.com/sampson-snake-root.html. In the oils, Steady Work oil is pretty much a must for job-getting - it has herbs and curios directly in the bottle to begin with. For the shoe trick, which shoe isn't all that important: it'll be different depending on who you ask. I usually use my left, because it's my non-dominant side, but that's simply personal preference. Speak of working with Saint, can I set a long-term goal for St. Joseph, like what kind of job i want, ...and pray to St Expeditus for each interview ? However, I read some post said, St Expeditus does like to work with other Saint. Is any idea about it ? And someone use honey jar to sweet interviewers...It seems like honey jar takes long to work, normally a hire decision may make in 1-2 days even hours. Is any other better idea to sweet them? Generally honey jars are a little slower on the get-go, although that's not always the case. Another good idea to sweeten them (not better - just different: there is no best in conjure, there are simply many ways to get to the same goal some which are more useful to you than others) is to mix some steady work sachet powder with a little brown sugar and cinnamon and use that mixture to dust you CVs and application forms as well as any written correspondence when you apply for a job. You can also dust your hands with that before your interview and then make sure to shake hands with the interviewer. Thanks for your reply. You got me again. I only add brown sugar in my coffee, so there is no white sugar in my kitchen. If it is an online application (thanks to the modern technology) and i want sweeten bosses, what could I do? I wonder why someone carry Gravel Root and salt when they go on their interviews? What does salt use for? Is it better to burn petition paper after praying or take it with me ? How to do a divination to determine if Saint is willing to work for my case ? almondworld wrote: If it is an online application (thanks to the modern technology) and i want sweeten bosses, what could I do? jwmcclin wrote: If you are doing electronic applications work with the oils lightly dress your computer screen at each corner as you petition for your job success. for this you could use a combination of Steady Work, Crown of Success and Look Me Over oils. almondworld wrote: I wonder why someone carry Gravel Root and salt when they go on their interviews? What does salt use for? almondworld wrote: Is it better to burn petition paper after praying or take it with me ? almondworld wrote: How to do a divination to determine if Saint is willing to work for my case ? Steady Work and Attraction would be more suitable for a job interview. I was burning a job-getting Steady Work candle for a friend and the glass turned completely black from top to bottom leaving only approx an inch or less.. which that amount of wax did not burn. There were also smoke on some days. 1) I read that this means that the work is incomplete and I should burn another candle. 2) What if this happens again? and again? 3) i don't want to keep wasting money buying candles..Any Advice? You can start with some some cleansing work such as Uncrossing and then a Road Opener before you begin the next candle for them, and see if that helps. 1) That's not the kind of interpretation i was taught, nor do i teach it. A black sooty candle means ENEMY WORK -- someone is actively opposing or fighting your firned and trying to keep them from getting a job. Also, unburned wax at the bottom indicates this problem has its roots in the past, unresolved issues of some sort. There is a LOT more here than meets the eye. 2) Get a reading, as Starsinthesky7 recommended. Also, do cleansing and road opening as she recommended. If you are buying your own vigil candles and dressing them with Lucky Mojo oil, you may have put too much oil or too many herbs in the candle -- so be sure you know what you are doing. Our candles come already dressed and seeing one of them may teach you how a dressed candle ought to look -- but even ours sometimes go crazy and produce terrible results -- and when this happens, rather than worry about "what next?" i try to divine the spiritual cause. 3) Learn how to do a cleansing and road opening for your friend. Make sure you either buy well-dressed candles from Lucky Mojo or learn how to dress candles yourself and set them in such a way that you can be sure it was a true divination and not your lack of experience or your error that caused the mess. This thread has been merged into the thread on Steady Work Vigil Candles Questions and Answers. Thanks a bunch!... That could have been one of the problems.. i bought it at a local place and they dressed it there.. I will follow the steps that you suggested beginning with a reading and will also try the lucky mojo candles. Also sometimes additional work may be needed after the steps starsinthesky7 and miss cat recommended but your reading will reveal that or you might ask. This is why I like the spellkits that include everything needed from instructions to protection in many cases. Missk: I have also noticed that in my area, when people use an"shall be un-named" brand of inferior oil to dress the candles, there are a LOT more sooty/black candles that at other places I have seen burn candles. While this may just be caused by the people/conditions that the candles are burning for, you never know. When using the Lucky Mojo Vigil candles that Lucky Mojo actually sells and uses you are assured that there is at least a quality control for you to build your divination on. I have burned many vigils dressed with Lucky Mojo oils and I have just now gotten a feel for if the actual candle/dressing is at fault, or if it is much more than that and more immediate attention needs to be paid to the situation. Basically, I am trying to say that is is hard for us to give a good interpretation or divination towards your candle burn if you have used "X" brand candles dressed with "X" brand herbs and oils. Hello, I currently have a babysitting job, but the baby's mom is at risk of getting fired. Naturally, if she gets fired I GET FIRED, because I will no longer be needed tothis... babysit! I have steady work oil, but don't know what I can do to remedy this. I mean if she continues to go to work late is inevitable. Help please! Thanks Joseph.. I will try working with the LM candles and oils, after my reading i guess.. Which leads to my next question.. i made an appt for a reading but that isnt until the end of May.. should i do anything else while i am waiting? is there anything i could/should do ? missk, you are on the right road starting with LM Steady Work conjure. You can call the shop and ask them to set lights for you until you get your order. Its your call. The shop is open 7 Days a Week, 9:00 am - 5:00 pm Pacific Time voice: 707-887-1521. Im the babysitter who she pays off the so on days when he does not come, naturally I dont get paid for the day. Right now she is in danger of getting fired so if that happens, I will no longer be needed to babysit him. I have steady work oil and was recommended to go to Saint Anthony, because this requires a serious miracle! I don't know if tge is the right approach, so I need serious advice and help! Ugh my phone is giving me problems, I was trying to state that I get paid off the books and if going to Saint Anthony is the right approach. thanks jwmcclin...this may b a stupid question but what exactly does that mean? "setting candles for me"? missk: "Setting lights" is the act of having someone light, work, and divine a candle for your situation. This is generally done when the person in question cannot do it themselves, either due to living circumstance or to have a more skilled practitioner set the candle work for you. Here are a few links for you regarding this topic. My steady work candle burned clear up until the end then it started to turn black/soot/Gray b/c it was burning the herbs and what not on the bottom (no more wax). Does this mean anything?... the clear burn until the end?... or a sooty candle? I have a "fake name" that I practice under and my legal name. ( I teach investments with another name other than my legal one because of the slander people can do online when we are wrong). When carving my candles should I put both? I've been thinking if this matters or not. Work is for crown of success and steady work. Thank you in advance. Wow congrats. You are making me want to try this myself. However, I want to make have my own business though but I am happy for you! Hello all, finally found this thread on candles work I bought Attraction, look me over, steady work and road opener bath crystals. I have applied for a specific job and wasn't considered. I applied said job based on 2 positive psychic card readings. 1. Do I do the bath crystals first and then light the candles? 2 Do I burn all three candles at the same time? 3. In the steady Job forum, it was suggested to put the job description under the candles. Will I still be able to put my own petition too? Or will this be like requesting too many things at once? 4. I didn't buy the oils because of budget, will it still be ok? 5. I have a St. Anthony card, I keep it under my pillow. I finally broke down last night when I told myself that I didn't get the job. I held it in my right hand to my chest and petitioned so I'll be given a second chance. Will this possibly help with the candles? Or am I praying to the wrong Saint? Thank you all. I really appreciate your help and advice. 2 Do I burn all three candles at the same time?-That is up to you. But I would do the road opener first alone. 4. I didn't buy the oils because of budget, will it still be ok?-You can try. 5. I have a St. Anthony card, I keep it under my pillow. I finally broke down last night when I told myself that I didn't get the job. I held it in my right hand to my chest and petitioned so I'll be given a second chance. Will this possibly help with the candles? -That is up to the Saint. Thank you. I will do the bath crystal road opener first then the 3 candles. So for the petition, combine job description and my petition to one? Sorry to ask. Thank you. I would still put a petition stating what you want to have happen. You can write it right on the job description if you like!